This month’s “C” word is CONCENTRATION. In “C” You In The Major Leagues’ vernacular, CONCENTRATION is a person who has the ability to focus; hones instincts; prepares with a purpose. Any player who’s been successful in the major leagues could check off CONCENTRATION as a character trait. That’s especially true for pitchers. In Royals’ history, one who sticks out as much as any other is Mark Gubicza. A full version of this story about Gubicza and the “Gubie Stare,” appeared in the book, 100 Things Royals Fans Should Know & Do Before They Die. 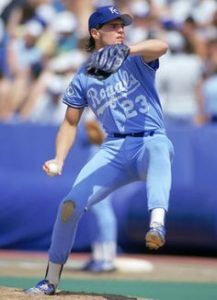 Throughout the Royals history, there have been intense players who had incredible focus and concentration. There have been guys like Hal McRae and George Brett, who’d take out a second baseman with a barrel roll if it meant breaking up a double play. Or starter Dennis Leonard, who once beaned a much bigger Don Baylor and then stood in front of the mound ready for a confrontation (and got it). Or closer Al Hrabosky, who’d stand behind the mound and, after a few moments of calmness, would slam the ball into his glove and march to the top of the mound with smoke coming out of his Fu Manchu moustache. But, perhaps the most intense Royal of all time was pitcher Mark Gubicza, who was instrumental in the club’s 1985 World Series championship. During 1984-96, Gubicza, who was a hard-throwing right-hander with a wicked slider, won 132 games (third all-time for the Royals) and recorded 1,366 strike outs (second all-time). In 1988, a year after an uncharacteristic 18 losses, Gubicza won a career-best 20 games, the seventh pitcher in club history with at least 20 wins. The season he also had a 2.70 ERA, which was the third-lowest at the time. There’s no way to tell definitively where Gubicza got that intensity and focus and concentration. Perhaps it was his Philadelphia roots. Or his hockey roots. Or, perhaps the intensity is partly what helped him excel in sports growing up in Philly, including hockey. “(The stare) wasn’t directed toward the player who made the error,” he says. “It’s just that you want to get everyone out and you feel you have to try harder on the next batter when an error is made. As a starting pitcher, you get to play once every five days, so you have built-up energy and if it looks like someone behind you isn’t giving their all, it is difficult to hide your emotions. In many ways, on the mound Gubicza resembled his mentor, Dennis Leonard. Both righties challenged hitters. They were both highly competitive. And they’d throw a fastball through a batter if needed. Gubicza and the “Gubie Stare” were inducted into the Royals Hall of Fame in 2006. He and Leo bookended the first championship stretch in Royals’ history.